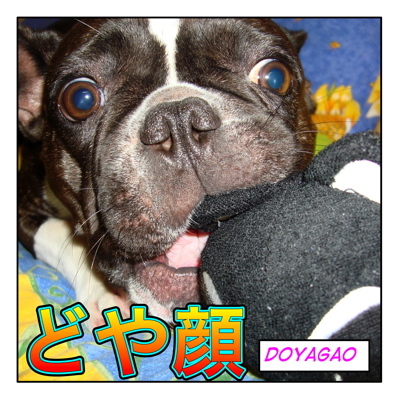 Today I will teach you a relatively new slangy word どや顔 ( = doyagao). We hear this more and more often on TV these days. = Sono “doyagao“ yamero!/ Sono doyagao yamete! =Wipe that smug look off your face! = Hey, look at this smug face! = What a smug face (he/she has)! They say this expression started becoming popular when a comedian from Osaka used it in a talk show. From there it started to spread immediately. = Don’t you think I am great? / I did great, right? They say this when they are showing off something. For example, when you win a game, succeed at something, get something really nice and want to show it off, show off your nice muscles, etc., you look around as if you are saying 「どや！」( = Doya! ) How’s that! “Did you see that?” “I am great!” “I did a great job, didn’t I” and people would think you have a smug look on your face. That is called どや顔 ( = doyagao) . = a smug face, a triumphant look, a cocky face, a facial expression that says, “I know everything”. So I got a new toy! どや！= Doya! and sensei, what do people in other parts of japan think of Kansai people? cause I heard from some Kansai friends that Tokyo people for example are really “proper.” So I was wondering, is there a certain image of Kansai people? It doesn’t sound stuck up it just sounds funny. We use it jokingly now. Kansai people are considered to be very warm, funny and friendly. That is why many comedians are from Kansai. On the other hand, imagewise, Tokyo people might be cooler but more distant. Personally I love Kansai people and kansai dialect! Thank you for visiting this site! Please come back!